The site does not accept breeds/crossbreeds listed in the Dangerous Dogs Act: Pit Bull Terrier, Japanese Tosa, Dogo Argentino and Fila Brasileiro. Newcourt Farm Campsite offers clean and well maintained toilets and 50p coin metered showers. 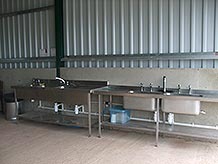 There is also an undercover wash up area for pots and pan cleaning. A chemical waste disposal point is behind the shower block and there are several drinking water points on site. The site has a few 6amp electric hook ups, however, these are not available Bank Holidays and Festivals. Due to our rural location we do not have the electricity supply to provide more than two showers, 1 for males and 1 for females.